One of the oldest operating yachts in the world, El Primero, could become a floating museum thanks to the generosity of her owner, Christian Lee Lint. The 120-foot luxury yacht was hauled out in Port Townsend Boat Haven last month and owner Lee Lint is now hoping to donate the vessel to the Tacoma Historical Society. El Primero was built in 1893 at Union Iron Works in San Francisco for Edward Hopkins. Chester Thorne bought her to Tacoma in 1906 and the yacht has primarily cruised Puget Sound waters ever since. 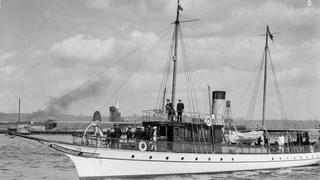 The yacht was originally steam powered but was converted to diesel at some point after 1955. Mr Lee Lint — a tugboat captain— purchased the boat in 2010 and is now hoping to get the maritime relic permanently moored in one of the city’s docks as a working museum. "I saw it under covers, all rusted and neglected,” Mr Lee Lint said. "I'm spending tons of money making it good enough to give away. The boat is really cool." A local group led by Richard Hildahl and Stan Selden is also helping to transform the boat. "The Tacoma Historical Society was wonderful," Mr Lint added. "Stepping up to the plate. They see the value of the boat." El Primero was once considered one of the most luxurious on the West Coast. She transported four different presidents, including William Howard Taft when he came to Seattle to visit the Alaska-Yukon-Pacific Exposition in 1909. Mr Lint has offered to help maintain the boat if it is donated to the Tacoma Historical Society.